Fantastic, you think! I now have myself (or we have ourselves) a whiz-bang holistic context that captures what is most important to this or that whole I am part of managing. Let’s stick it up on the kitchen or staffroom wall and start enjoying its magical power to transform our lives. Well, unfortunately it doesn’t work quite like that. As intimated above, articulating your holistic context is pretext to actually starting to get to the whole point and meaning of Holistic Management, namely managing holistically. What the holistic context, and the discussion and clarification that happened during its formation, does, is give you a reference or anchor point that then guides decisions and actions. It is like you have now captured the ‘true north’ of your whole, and you can start managing the whole towards it. Let’s take a look at what that looks like, as well as a few other ways we have found our holistic context useful in managing our company. Keep in mind that managing holistically is for most of us a big change. It is analogous to learning to ride a bike and can take a while to get the swing of. The fruits, or payoff, however, we have found to start flowing during the process of clarifying our holistic context, let alone in its application. Management is decision making. Sound decision making is at the heart of any thriving, successful whole managed by human beings. 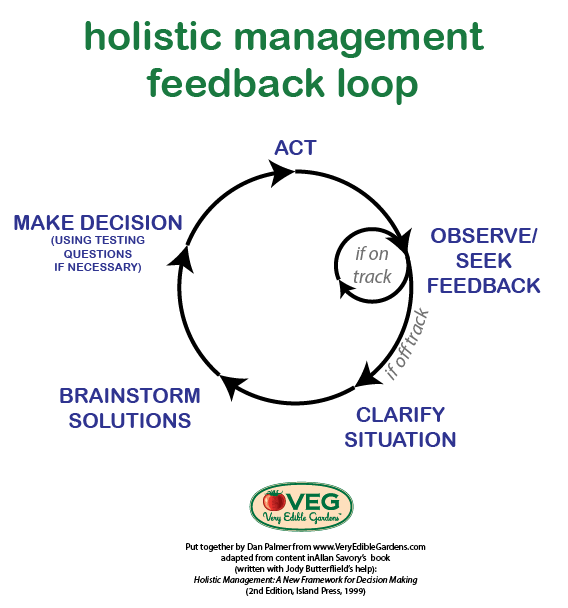 Holistic Management is a decision making framework, and its whole point is to help decision makers make holistic, sound decisions. You usually find yourself in the position of having to make a decision in response to a problem, need or opportunity. You discover that a part of your business is losing money, let us say, or you know you soon need to either replace or repair your photocopier, or you are invited to come and present at a conference. Whatever it is, in Holistic Management you don’t reject the ways of making decisions about this kind of thing that you have used in the past. You still do everything you used to do. But you add another layer. Conventional decision making the world over is reductionistic in the sense in leaves out important parts of the context in which the decision is being made. We tend to make decisions based on solving a problem, meeting a need, or reacting to an opportunity without fleshing out the broader context and consequences of that decision. This is where your holistic context comes in. In general, we find that once you have articulated your holistic context and you are familiar with it, it is like a gentle magnetic field that draws your decisions towards it. It gives your whole both not only its ‘true north’ but a rudder that lets you steer toward it. Over time this becomes more and more unconscious to the point where it can at times seem uncanny in that things in your holistic context are becoming and staying true almost all by themselves. Until that point, however, you must consciously bring your holistic context into your decision making process. Let’s look at how you can use what are known as the testing questions to do this. Explains Savory, “when asked and answered in quick succession, the testing questions enable you to see the likely effect of any decision on the whole you manage. You do not want to dwell on any one test to the point that you lose sight of the picture formed by scanning them all. With this picture in sight, you can be fairly sure that any decision tested is not only economically sound but simultaneously environmentally and socially sound, both short and long term” (Holistic Management, p. 267). Note the emphasis “quick” here. Savory’s words certainly ring true of our experience – we have found that in many cases we can make large, serious decisions in 5-10 minutes (I’ll give an example shortly). The Thrust or Greatest Thrust Question – if assessing a single action, for the effort, time and money invested does this action give us a decent amount of thrust toward the statement of purpose, quality of life, and forms of production statements articulated in our holistic context? If comparing two or more actions, for the effort, time and money invested, which gives the greatest thrust toward these things? The Future Resource Base Question – if you take this action will it lead toward or away from the future resource base described in our holistic context? The Root Cause Question – if we are considering taking an action to solve a problem, does it address the root cause of the problem? The Energy/Money Source and Use Question – is the energy or money to be used in this action derived from the most appropriate source in terms of our holistic context? Will the way in which the energy or money is to be used lead toward our holistic context? 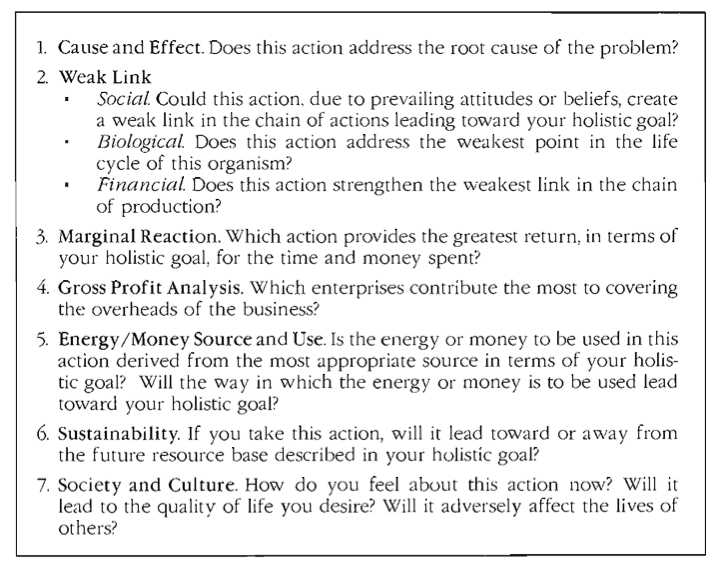 The Weak Link Question – does the action we are considering address a weak social, ecological, or economic link? Is there any sense in which this action could create an undesirable weak social, ecological, or economic link? The Most Profitable Enterprise Question – if comparing two or more enterprises, which returns the most gross profit / the most towards covering business overheads? The Gut Feeling Question – how do you feel about this question now? Now let’s first look at a real-life example that Allan Savory shared in a talk I attended in Melbourne in August 2013. Hearing him talk through this example really helped me appreciate how fast and easy it is to move through the testing questions. A problem required a decision. The problem was at a game park site in Africa where the private dirt road leading from the main highway to the game reserve headquarters was filling with potholes and becoming bumpy to the point that the drivers of the cars full of tourists were starting to complain. If we grade the road are we dealing with a symptom or the cause of the problem? We are addressing a symptom of things including poor alignment, drainage, bumps. All grading does is scrape off bumps. So we are not happy with grading from the perspective of this question. Move on. Would grading the road create a social weak link? – no, not as far as we know. A biological weak link? This is only relevant when dealing with a prevalence or rarity issue with an organism – so not relevant – move on. A weak link in the chain of production? – Don’t know (okay to say that or not sure). Move on. Not comparing actions so not relevant (as I’ll explain below Savory only applies this test when comparing two actions, whereas in our adaptation we also consider it even when a single action is being tested). Not comparing enterprises so not relevant. Grading the road will be addictive – we will have to repeat in future as we are addressing a symptom and not a cause. The energy will come from fossil fuels and will be entering an ongoing pattern of use and dependence. What about money – where will the money come from? (Let’s just be aware of where it’s coming from). Now where will it go? It will leave our bioregion with the grader. Will grading enhance or take away from our future resource base? It would lead away as the erosion would continue and part of the future resource base we depend on is stable access ways. So far the questions have been all about what we think, but having given attention to various aspects, we will make the decision based on what we feel. Interesting, we don’t feel so good about this anymore. Maybe we should test the other option that we earlier dismissed, that we could employ locals to do the work manually? Okay, we’ve come back to the earlier dismissed suggestion about paying for locals to hand dig road. Yes we are addressing causes – because the work would happen by hand it becomes possible to improve the drainage, alignment and so on, in other words to address the road cause of the problem. No chance of creating a social weak link that we’re aware of, if anything we’d be strengthening links to do with creating local employment. Not comparing actions so not relevant. In this case the energy to power the workers would be solar energy (via the food they eat) and hence not creating an addiction to a finite resource. What about the money? It would come from the same place but where will it go? If dug by hand by locals in would remain in the community. Indeed, some may directly cycle back through our cafe and shop etc. Yes we’d be improving this not to mention the community flow-on effects of creating local employment (less crime etc). Hey we feel really good about this! So, having filtered the decision using the testing question they realised the at first untenable option of paying locals to repair the road by hand was actually the decision most consistent with their holistic context, so that is what they did. “Chris Knippenberg’s mother had offered to give her a horse that her two children could ride. All Chris and her husband Phil had to do was pay the cost of having the horse shipped from her parents’ ranch in Colorado to their farm in Vermont. Chris immediately started pricing transportation, which turned out to be expensive, but the horse was after all a gift, and the horse itself would be free. I think examples are the best way of getting a the hang of using the testing questions (and how simple it is to do after a few tries), and the more the merrier, so in the clip below I share how a few weeks back my co-director Adam Grubb and I made a relatively significant decision as to how we invest about 400 hours of our time later in the year. In this clip you’ll also get a feel for how we have refined a version and order of the testing questions that best works for us, based on our past experience. Furthermore, “as you become increasingly familiar with the seven tests through practice and begin to appreciate their value, you will automatically start to test every decision you make” (p. 270). In this clip I talk about how my perspective toward decisions has changed in the process of managing VEG and other wholes I am part of holistically. Decisions have become precious and enjoyable – how about that! “Once a plan is made, monitoring becomes essential because even though the decisions involved have been tested, events rarely unfold exactly as planned. Monitoring can mean many different things, but in Holistic Management it means looking for deviations from the plan for the purpose of correcting them” (p. 335). “A plan, no matter how sound, serves little purpose unless its implementation is monitored and deviations are controlled. Otherwise, even assuming no lapses at all in management, unpredictable events sooner or later render the best plan irrelevant or even destructive. Some will ask, “Then why plan in the first place?” We must plan, monitor, control, and replan simply because it is the only way we can make happen what we have said in our holistic context we want to see happen” (p. 341). Drawing on everything we have now covered above, here is how we approach problems these days. Clarify the situation and get on the same page about it. Research or otherwise gain relevant missing information as necessary. Brainstorm and note all possible solutions we can come up with. Unleash our collaborative creativity! In this clip I talk through a technique we have started using that is made very easy with a diagrammatic portrayal of one’s holistic context. I am captivated by the depth and scope of Holistic Management and its potential to facilitate our trajectories through the massive cultural transformation we are right now all in the midst of. We started using it as a business management tool. My wife and I have since used it in guiding the directions of our young family, I am increasingly using it in managing my life, in forming new ventures, and in facilitating its adoption and use with a non-profit organisation, a farm, and various other groups. I don’t need any more convincing. It works, it (or anything else that does what it does) is a key part of the solution human beings desperately need to navigate not only current circumstances but the, well, let us say interesting times ahead, and though I don’t think it is the whole story, my spine did tingle when I read Allan Savory stating “I would stake my life on the premise that if millions of humans in all walks of life would merely start making decisions holistically, toward holistic contexts they are genuinely committed to achieving, most of the problems we face would evaporate” (p. 272). I do hope that this article has been of some value for you, and that it has shed light on the holistic context behind VEG’s every move. Finally, I very warmly welcome any feedback or corrections any of you out there would be kind enough to offer me. Thanks for reading, and may that we will all continue to improve at making decisions that take us where we most deeply want to be, including a world that benefits, rather than suffers, by having us around. Keep in mind that almost all (if not all) the resources out there emphasise the application of the Holistic Management decision making framework to land management and often get straight into that topic without getting across that as a decision making framework it applies as equally to say the management of a show store or a family living in the suburbs. But here are some of the key websites about holistic management I’m aware of. If you find other do send them through and I’ll add them. Bruce Wards Legacy Trust Website Archives – A brilliant, unique and comprehensive set of free resources (webpages with video and audio clips) I have found extremely useful in understanding then explaining holistic management. This is where I found the short Bruce Ward clips I have used throughout the article. The Savory Institute – “promotes large-scale restoration of the world’s grasslands through holistic management.” Has useful introductory and advanced ebooks for sale. Holistic Management International – “Our mission is to educate people to manage land for a sustainable future.” Has useful introductory and beyond free ebooks. Inside Out Management – Brian Wehlburg’s private Holistic Management teaching and consultancy business including a great resources page with short vids etc. 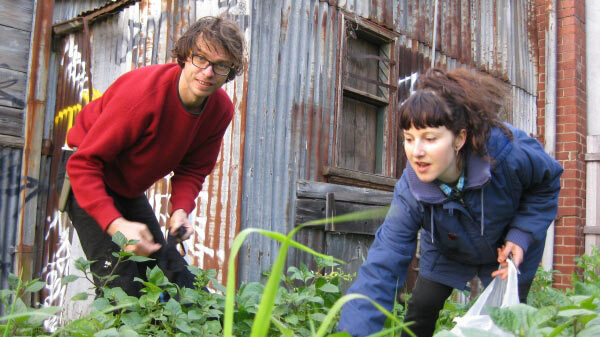 An article by our friend Tim Barker about what holistic management can offer permaculture.